Do you want to try Capoeira for the first time? On Saturday 30th November, from 11.30am-12.30pm, we will be hosting one of our Open Days, where you can see what our classes are like... FOR FREE! Children are welcome too, but if under the age of 8, they must be accompanied in the class by a responsible adult. Want to get fit? Want to learn something new? Need an interesting hobby? You don’t have to be extremely fit, strong or flexible to join and enjoy our classes. Over our six-week courses you will learn all sides of the artform working with the instructor, Kiri, to build confidence, fitness, musicality and rhythm, as well as an insight into vibrant Brazilian culture. Join our mailing list by entering your email address! In trying Capoeira we would always recommend doing a few classes before you make up your mind as to whether you like it or not. After just one session everyone feels a little disorientated! After a few lessons you will start to feel more confident, and be able to judge it better. That is why we have set up our Beginners Courses. We like to encourage all body types and abilities to join our group, and you will always be supported in learning Capoeira on your own terms. If you are unsure, or have any questions, please contact us. Plus, our Beginners Courses work out cheaper than our drop-in rate! So why not have a go? If you want to try Capoeira before you sign up to the course, then we run regularly FREE Open Days, usually the Saturday before the Course starts. 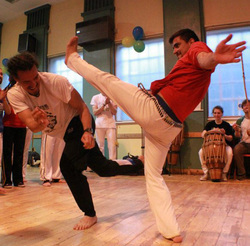 At these sessions you can have a taster of what Capoeira is, and get a voucher for the course if you wish to sign up. Join our mailing list to hear about our next FREE class.